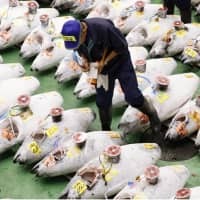 The noisy clanging of bells that had once sounded at the famed Tsukiji market marked the first tuna auction for fishmongers at the Toyosu wholesale market Thursday at a newly built facility in Tokyo’s Koto Ward. The new market sprawls over some 40 hectares and its facilities are state-of-the-art, a sharp contrast to the gritty atmosphere of the Tsukiji market, which was around half the size of the Toyosu site and saw its 83-year run come to an end on Saturday. The long-awaited opening of the market comes after a two-year delay following controversy over soil and ground water contamination at the new site, previously a gas plant, that led the Tokyo Metropolitan Government to take additional safety measures to deal with the problem. It was business as usual for the buyers at the market: Shouting by auctioneers followed the clanging of the bells as intermediate wholesalers wearing caps and rubber boots made their bids through hand signals. 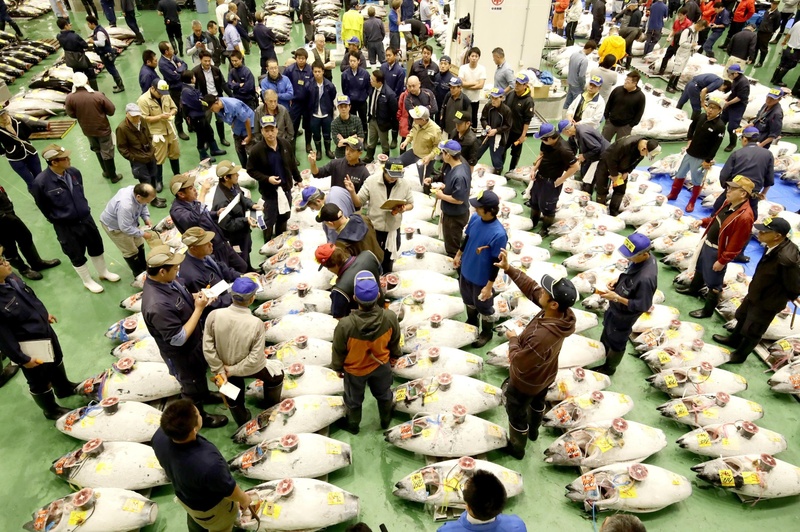 Yet, unlike the auctions at Tsukiji which were spread across three rooms — one for fresh tuna and two for frozen — hundreds of tuna were laid out in one massive hall with high ceilings, making for an impressive sight as bidders milled about among 1,000 or so fish. Dignitaries gave opening speeches early Thursday morning, expressing a mix of cautious optimism and firm resolve to make Toyosu into the global brand that Tsukiji became. “It’s essential for us to pass down to younger generations the skill, know-how and tradition that we have accumulated for over 80 years at Toyosu, while also aspiring to fulfill a new role that will be in tune with the current era,” remarked Hiromi Amino, president of Daitogyorui Co., a seafood wholesaler that relocated to the new Toyosu site. “I’ll be looking forward to working with all of you to build a reputation for produce at Toyosu that will exceed that of Tsukiji and make this new market one that will last another 100 years,” he said, addressing the market’s workers. 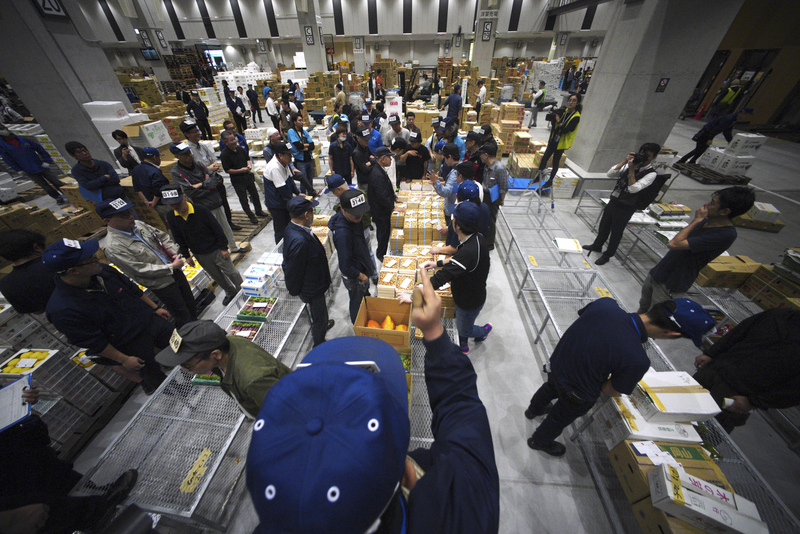 Some intermediary wholesalers echoed the sentiment of their seniors with their determination to make Toyosu a success. “We will be doing our very best to make this market an appealing option for our customers,” said 49-year-old Yasuhiro Yamazaki, president of seafood intermediary wholesale company Yamaharu Co. “Whether we can make this place work is up to us,” he added with a smile. Others were less optimistic about the move. “It’s really hard to adjust when it comes down to it,” said an intermediary wholesaler at the fresh produce market who declined to be named. The move to the site about 2 kilometers southeast of Tsukiji was decided back in 2001, but the plan was threatened by safety issues. Shortly after Tokyo Gov. Yuriko Koike took office in 2016, she announced that she would push back the schedule of the relocation that was initially set for November the same year. 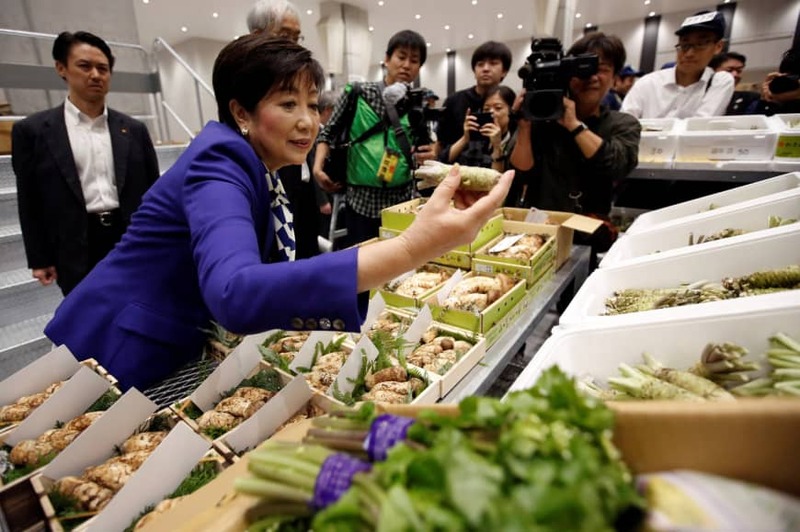 After anti-contamination measures were taken by the metropolitan government, Koike declared on July 31 this year that the site was safe for use, paving the way for the new market to open at last. “I believe that the past two years gave us the time we needed to ensure the safety of this market, not just for the present but also for the future,” the governor told reporters at the market Thursday. She added that it will be important for her government to work with Toyosu market officials to identify issues that need to be solved. The new market — an enclosed structure unlike the open air market of Tsukiji — will allow for better internal temperature control. It also includes a sanitation system to keep the facilities more hygienic. “I have a lot of hopes for this market, but first we have to face reality step by step,” said Hiroyasu Ito, chairperson of the Toyosu Market Association, formerly the Tsukiji Market Association. “We first need to get used to this new environment, and I’m sure that as we join forces and work together, we can integrate new and progressive ideas into the management of this market,” he added. The highest bid at the market’s first tuna auction was ¥4.28 million for a 214-kg fish caught off the coast of Minmaya in Aomori Prefecture. 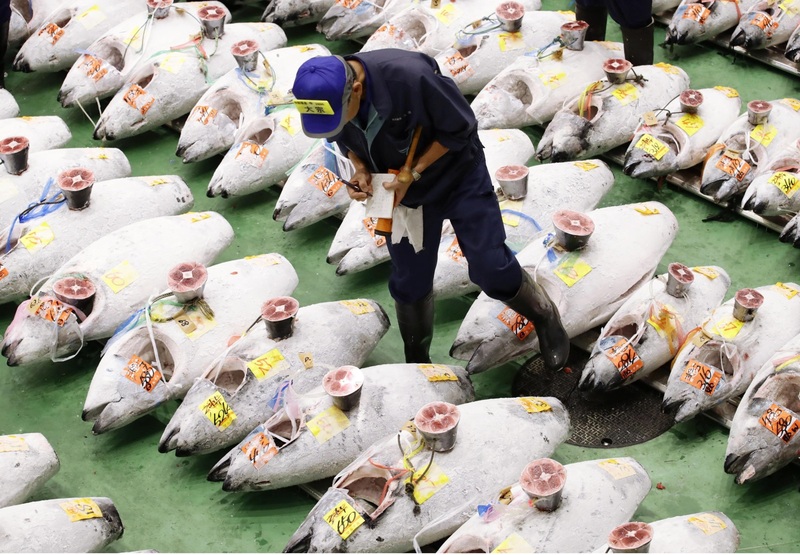 The restaurant and shopping floors of the Toyosu market will be open to the public from Saturday at 10 a.m., and visits for tourists to the early-morning tuna auctions will resume on Jan. 15. Although visitors won’t have direct access to the hubbub and noise of the auctions and the market like they used to at Tsukiji, they will still be able to see the action up close from a glass-panelled deck overlooking the proceedings. The site of the old Tsukiji market, built on reclaimed land in the heart of the capital, will be used to pool transport vehicles for the 2020 Tokyo Olympics and Paralympics. A section of roadway will also run through the site to improve access from central Tokyo to the bay area, where some Olympic facilities will be located.